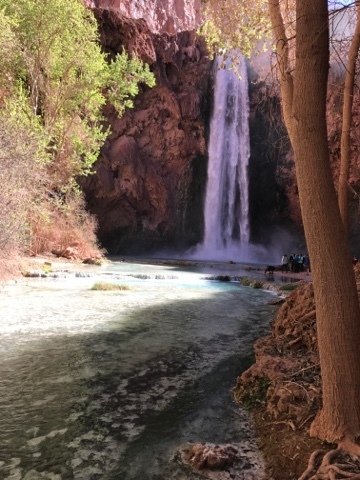 Mooney Falls is about a mile past our campsite on the Havasu Creek. 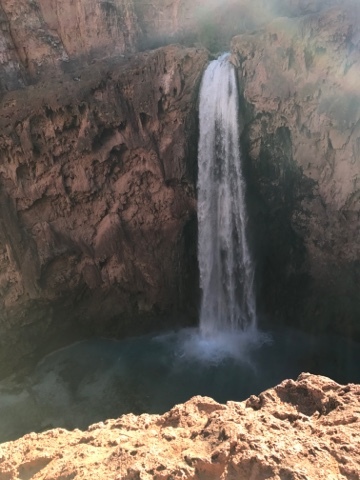 The falls is about 200 ft high and the hike to the bottom can be a bit intimidating, listening to others that have climbed down to the bottom. 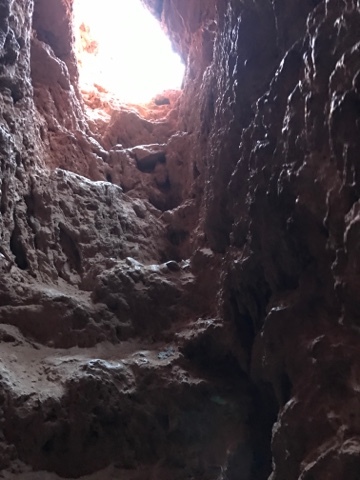 I have read about the climb down and talked to a few others that have "been there" - "done that", and most cautioned me about the damp cliff, that you have to maintain a foothold to, as you hold on to misted chains, until you get to a ladder to make your final decent. 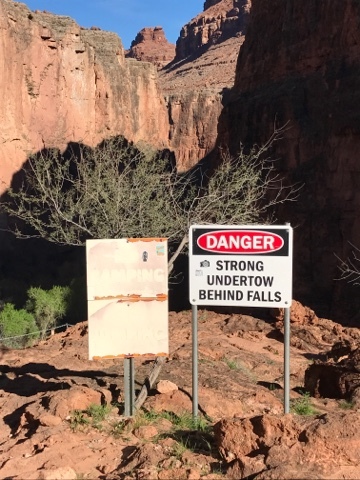 I was prepared to try climbing down to the bottom of Moony Falls, but the cautions sounded more difficult than my desire could overcome. We arrived early in the morning with our backpacks less stuffed to make a long day hikebout of climbing down and hiking to Beaver Falls. 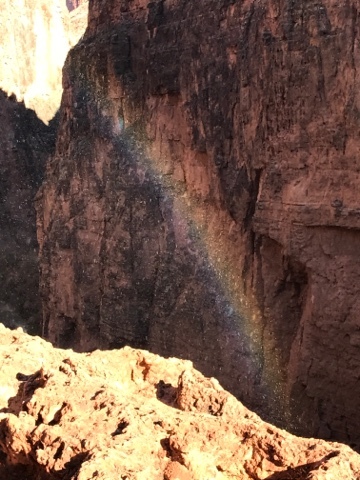 When we arrived the sun was low in the sky and it reflected the mist from the falls to form a rainbow. Neither of us were planning to do more than wading in the water but the sign is for those that wish to adventure behind the falls. 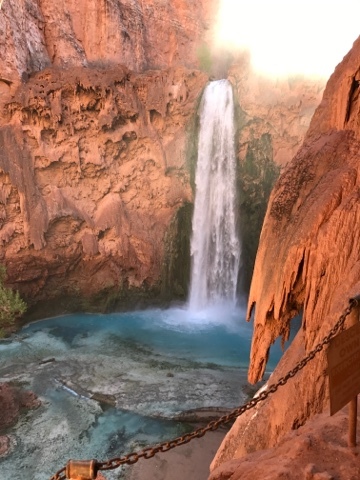 Above is a picture that illustrates the importance of time of day to see the falls. The colors pop when you have sun to reflect the water. 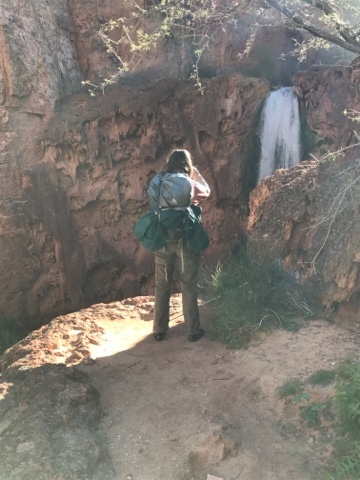 Joanne is catching a photograph of Mooney Falls before we climb down. 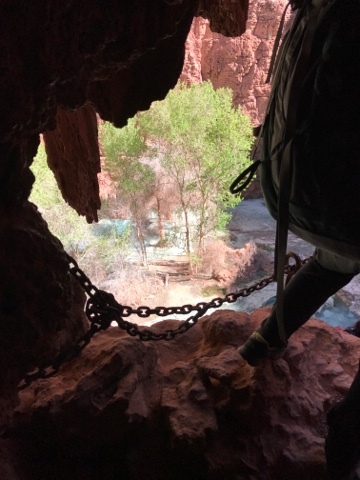 After walking a short distance down along the edge of the canyon you come to a couple of caves with steps inside, that take you partway down the canyon wall..
You come out of the first cave and you have a good view of Mooney Falls. 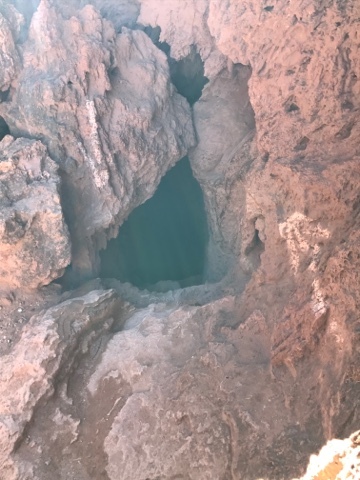 Above is a look inside the steep second cave. Finally after the second cave you can see the pins and chains that you must use to descend to the ladders that will take you to the bottom. Both Joanne and I took turns to check out climbing this area. 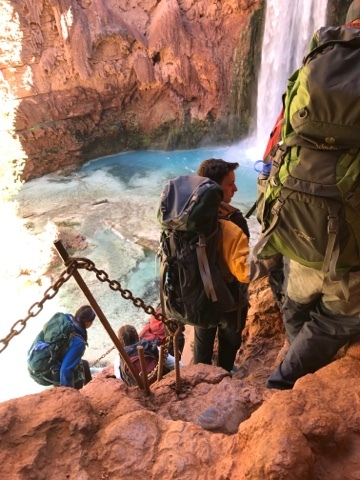 I decide to return to the camp and divest of our packs and just carry water and a snack to make it easier to climb into the canyon over the pins, chains, and ladders. After we got back to the campsite I told Joanne that if it was too difficult to descend the chains we could skip going, as we got some good photos of the falls. She told me she thought she could do it, thus increasing my desire to overcome my concerns about trying to do it. That was our decision to do it and we headed back to the falls carrying just a few things. In actuality, Joanne convinced me we should do this hike as I was concerned with the open heights. I felt that if she could do it I would as well. I kept on hearing the guy I met on my Wasson Peak hike who said to me that I needed to do it. We arrive back after going through the second cave and there was a large group of young folks in front of us. The one down a bit and to the left was a young woman yelling encouragements to those that may have had fear of the climb. There were big cheers for each person who made it down. We waited for the group in front of us, but I liked having the group there as they gave confidence to our ability to do it. It was time to move on down ourselves as I watched how the young folks in front of me switched chain holds with hands and placed footholds. It was too wet and I needed my hands, so no more pictures until I got to the bottom. 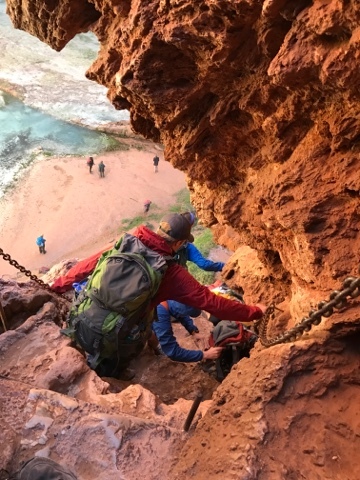 This is a good picture of the line backed up waiting to come down the canyon wall, with each person descending down through the chains and pins. Joanne is on her final descent on the third ladder. We both thought there was only one ladder, but there are 3, two short and one long. The difficulty you can't see is how hard it was to transition from one ladder to another, as they are not aligned but skewed causing some gaps between each ladder. The last long ladder had a large gap at the top between it and the next one up. The gap was between the top rung and the face of the wall where next ladder hung. The gap was a foot to a foot and a half where you could slip and fall between the large ladder and the wall of the cliff. This gap caused a problem for a number of people going down and up. Going up seemed harder as the chains hanging on the wall at the top of the long ladder were far apart, side to side, thus it required effort to take your hands off the long ladder and grab the hanging chains, then step up on the top rung, while stepping over the gap to the wall to the next ladder. For me, my upper body strength and long arms provided me confidence and stability to make the transition over the gap. A number of people found it more difficult. Joanne and I congratulated each other while the young folks take a group selfie for overcoming their fear of the climb too. 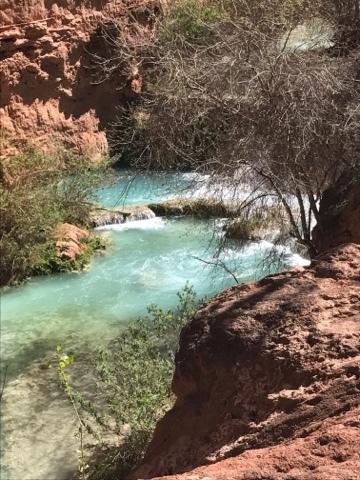 The Moody Falls and Havasu Creek from it is beautiful and well worth the trip down the canyon wall. We were glad we did it. 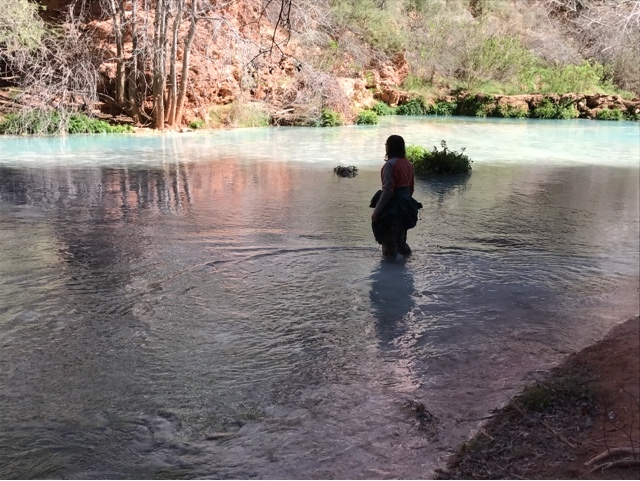 The trail along Havasu Creek continues all the way to the Colorado River but it is a long way. 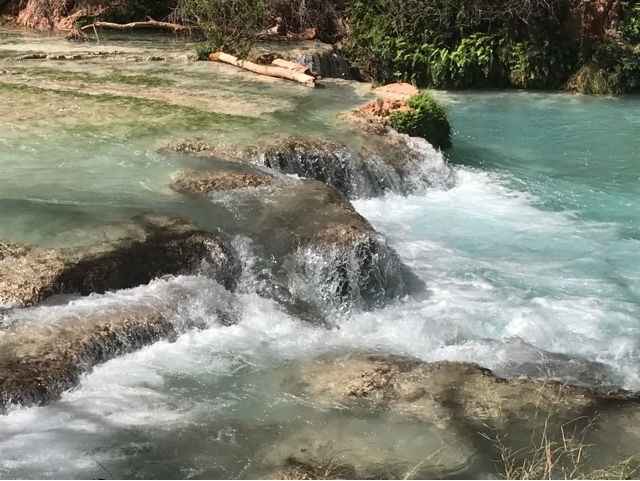 The limestone deposits has formed in many places to make mini falls. 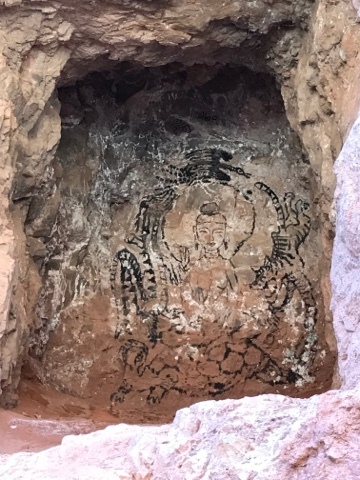 At the second crossing there was a notch carved out in the canyon wall with this exotic sketch inside. I don't have any further information about it. 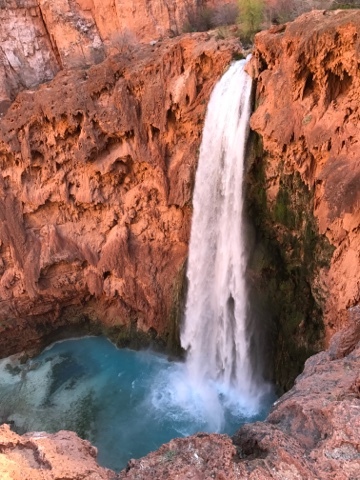 Above is an excellent example of the hundreds of mini Falls that exist o Havasu Creek. 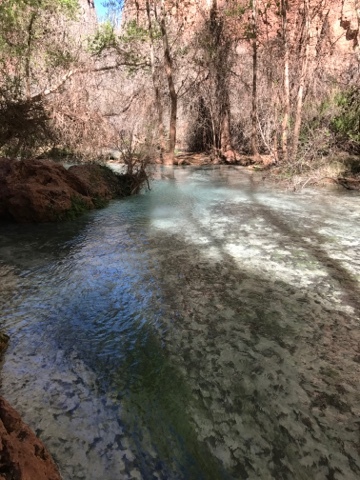 Back at Mooney Falls we stopped to take pictures of the limestone formations that were left when the Creek used to flow over this location. The limestone deposits grew in the shape of the water that used to flow there. Joanne pointed out it looked like a dog. Above the sun was in a different angle to give a different coloring to the water and canyon walls. I liked the three dementional view of the falls, canyon walls, and mist from the falls. 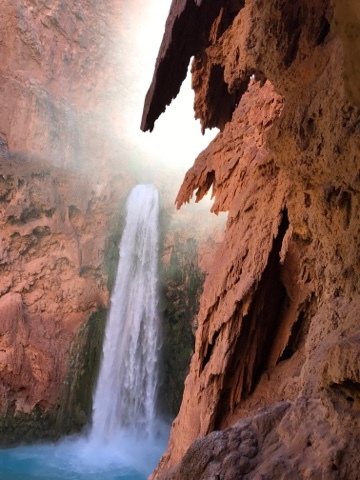 If you get to do this hike do your best to make it to the bottom of Mooney Falls. Good job Dad. Was it scarier than the mountain we climbed in Victoria? I would have had an easier time in Victoria if they had a chain to hold on to. Overall this was scarier due to the constant mist that wet the rocks (footing) and chains that are also wet and some just hang and are not connected at bottom. Some places I felt more comfortable going down facing out and other times face in. 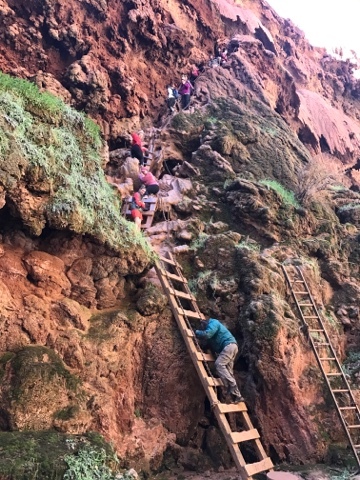 The toughest spot was the large gap at the top of the first ladder where you needed to let go of the ladder rails and grab the chains and continue to climb putting your feet on the top rung and make a giant step on to the wet dirt cliff before you mount the next ladder. what an adventure! They should fix that ladder. That seems a large gap for my short stature. The stone formations on the walls remind me of gargoyles on buildings. 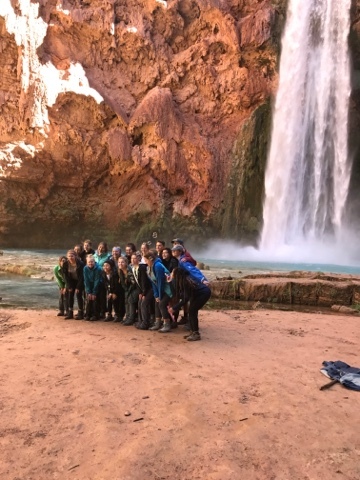 The people added to the pictures they were in, they helped give a sense of scale to the falls. 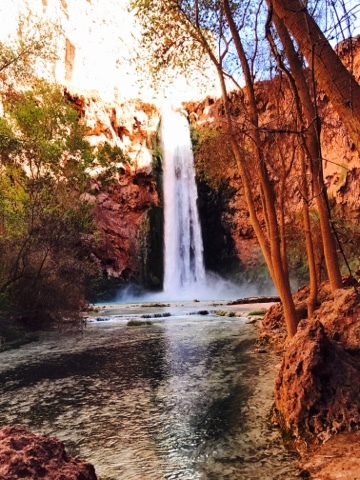 It is my understanding that the Havasupai do upgrade and fix the climb from time to time. If you look at the lower ladder picture there is an old ladder that was replaced with the current ones. 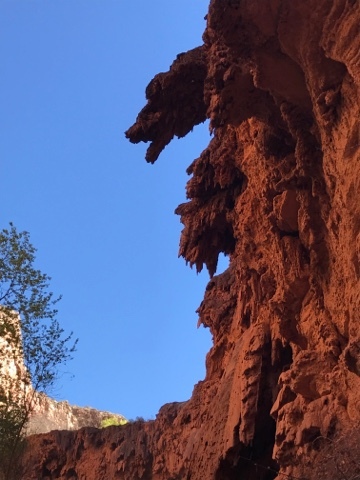 Yes, Joanne also thought the sediment formations looked like Gargoyles. I am careful in taking pictures of others for their privacy, but I needed a picture to show everyone what that climb down was all about. Beautiful pictures!!! That is quite a steep climb, yikes. The group of kids gave me the desire to move forward, but it was Joanne saying to me she could do it at tipped the scales for me to return and make sure I did it. We met another young couple that couldn't climb down due to their concern for the climb, so I felt better about my reservation that I overcame.